Home to Baseball and Bonhomie. The city of Baltimore is barely an hour distant from most of the metropolitan Washington region. Yet it offers visitors, and particularly families with young children, a wonderful introduction to a real American maritime and industrial city, one which is also making the transition to a new kind of urban renaissance for the twenty-first century. Over the years, my family, including three children aged 3-13, have made numerous day and overnight excursions to this country's fourteenth most populous city in the US. Once one gets over the psychological perception of Baltimore as a faraway destination, the city's attractions --from the well known spots along the rejuvenated waterfront to the less well known streets and alleys of Bolton Hill-- make for an easy outing that all members of a family can enjoy. The tour of Camden Yards [410-547-6234 tickets are $4 for children, $5 for adults] proved to be a favorite of my son Joshua, age 3, as well as his two older sisters. I need not mention that the idea of sitting for the first time in my forty plus years in a major league dugout, gazing out at the pristine playing field was even more of a thrill for me, an old Red Sox fan, and my wife, a diehard supporter of the Mets. The one and one half hour tours run all year round and are busiest [and most frequent] during the baseball season. Visitors are guided through the club level boxes, the press room, and the high-tech scoreboard control room before descending to the dug out and a fascinating explanation of the complex construction and maintenance of the grassy field. Babe Ruth's home was once right on the middle of center field. Today his birthplace and Museum is just around the corner at 216 Emory Street. 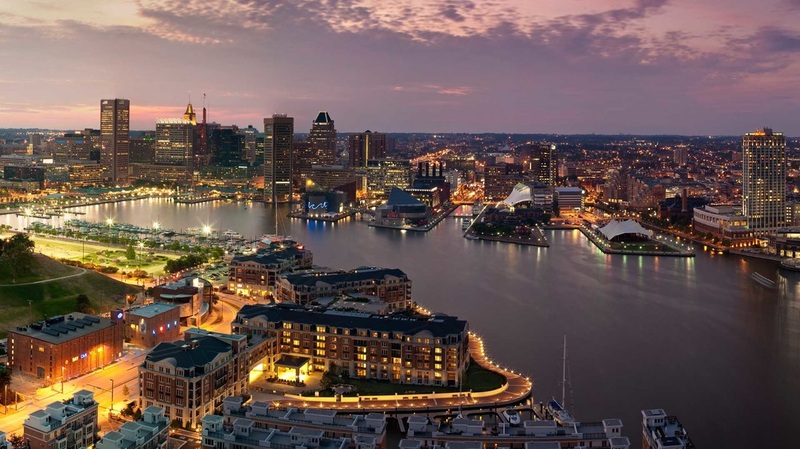 Visitors to Baltimore cannot but be impressed with the fact that most destinations of interest to the casual tourist can easily be reached by foot, water shuttle, or mass transit. From our perch at the Inner Harbor Marriot [410-962-0202], the ball park and harborfront, home to the Baltimore Aquarium were only steps away. My kids love the Aquarium, and particularly the outdoor shows, but I find the building smaller and darker than others I've visited in Boston, Camden, New Jersey, and Chicago. Earlier this fall, an afternoon was spent just at the Maryland Science Center, where the new film Everest was showing on the 5-story IMAX screen. The Harborfront, with its shops and restaurants, has claimed a top spot in rekindling the fortunes of Baltimore's urban core. I try to steer clear of the main promenade, and continue walking to the opposite side where the private docking facilities are located. The view of the harbor and cityscape is far better, the promenade is more navigable, and one gets a better sense of the port. On this side of the harbor in winter, you can rent ice skates and take a turn or two in the outdoor rink. In summer and fall, the rink is replaced by a miniature golf course, which was almost empty on a recent Saturday despite the throng of visitors on the city side of the harbor. The B & O Railroad Museum [410-7522464 901 W. Pratt Street] is an unlikely, but mandatory stop for any visitor of whatever age to the city. The high point of the tour of the museum and Mt. Clare station, built in 1851, is the spectacular 22-sided roundhouse, where 22 of the oldest and finest specimens of America's railroad history are on display. My son Joshua, a Thomas the Tank Engine groupie, thought that he had died and gone to heaven as he scampered around the diesel and stream locomotives arranged around the roundhouse's ancient, but still operable turntable. What proved more surprising was the interest of my two girls, one of whom still keeps her ticket from the half hour trip on the Mt. Clare Express along the route where the first passenger engine operated in the US departed from in 1830, posted on her bedroom wall. One of the best buys in town is the $3.00 fare for the water taxi that offers passengers a choice of 17 stops along the waterfront, from the Inner Harbor to the shops of Fells Point or the restaurants of Little Italy, and [with a land connection] to Ft. McHenry. ﻿"The ball park and harbor front, home to the Baltimore Aquarium were only steps away"
My wife and I cruised around the harbor one recent Saturday late afternoon on one of the water taxi's smaller boats. We were staying, sans children, for one night at the newly renovated Hilton , formerly a Radisson hotel, a short walk from the harbor. The hotel is just across the street from the Morris A. Mechanic Theatre, where the national company of Rent is now performing. We hadn't purchased tickets and as we passed by, noticed that a small number of seats for that evening's show were being sold at the box office for $20 each -- a real bargain! But there was no horde of budget conscious theatre goers, just a line so short I had to ask twice to assure myself that this tiny queue of less than ten people was all that the entire city of Baltimore could muster for a cheap night out at the threatre. Alas, we were just shy of the last lucky purchaser, but we've learned a valuable lesson for our next visit. No matter, we took the water taxi to Little Italy, where a table was waiting for us at Aldo's [410-727-0700], recommended by a friend. We weren't dissuaded by the lukewarm review in the local press, and we were rewarded for our fortitude. Dinner for just the two of us, in an intimate alcove in the front of the restaurant, was without fault, including the best wine I have had at a restaurant in a long time, even at five times the $20 dollar price. The Baltimore Area Convention and Visitors Association is a "one stop shop" for information about the city and its attractions.